KAABOO looms over San Diego in a sort of turquoise haze. An edifice of blase relaxation, accessible amenities, familial embraces, and frothy brews. On the about me section of the festival’s website, we get a glimpse of its recreational constitution: “An adult escape, uniquely curated to appeal to all five of your senses,” the page proudly exclaims, “with world-class music, hilarious comedy, incredible cuisine, craft libations, inspiring contemporary art, and personal indulgences.” The terminology, deliberately employed to look cavalier in its hospitality, sounds reminiscent of a cruise ship flier. The punctuation lies in KAABOOM’s reclined ambiance, it’s referendum of repose. Ah, spa day at the festival! The brainchild of businessman Bryan E. Gordon, KAABOO likens itself to an “escape”. A festival where you relent to an easygoing and “curated three-day sound voyage that combines rock-n-roll music and tastemaking events in a modern wonderland” The tent poles of this sprawling event are decorated with artisanal and florid language. They paint a picture of grief-free fealty: No challenges, no choices. Let us set up your hammock, and propel you into a rhythmic and cathartic swing. Gordon wants to strain the uncomfortable pangs and sticky indecision from your festival experience. KAABOO wants to be easy, homogenized, and presentable to the point of being a Knott’s Berry Farm ride. It’s a music festival for people who hate music festivals, or at least admonish what they represent: mercurial candidness and discovery. And, really, all good art festivals should be about discovery. If not for that, public gatherings become less about community and more about monetary agendas. The masthead of an unpretentious event should have forward-thinking sails, not ones that are comprised of veiled “comfort”. So why did Bryan E. Gordon come up with KAABOO? “The quality of the hospitality and the guest experience will, hopefully, be a step beyond what anybody experiences at other large-scale events like this,” Gordon told Del Mar Times. 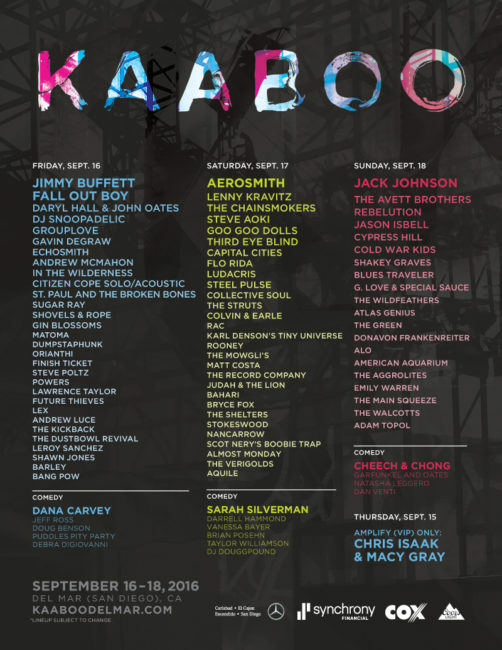 It would be easy to demonize corporate entities with industry-minded terminology, but perhaps, with the right resources and prudent acknowledgement of important artists, KAABOO could be a welcome addition to a San Diego landscape that is in desperate need of a music festival – the dearth of arts is real in America’s finest city. But when looking at the festival’s lineup, there is a clear, pulse-free denial of pertinent music, challenging compositions, or local acts. With a popgun array of contemporary mainstays such as Hall & Oates, Jimmy Buffet, and The Goo Goo Dolls, there seems to be a disconcerting lack of acknowledgement when it comes to challenging, interesting, and immediate works of art by some of music’s most revered and fascinating bands. For every obedient shrug and guileless booking of a contemporary aughts crooner like Jack Johnson, there is a distinct omission of a relevant artist of note (where is St. Vincent, Grimes, or Frank Ocean?). The difference between KAABOO’s vanilla wafer parasol-twirling and the sweat-slathered recalcitrance of festivals like Bumbershoot and Coachella is that the latter venues have a distinct awareness of what is culturally important and uncompromising. While it’s strange and ultimately interesting to see artists like Matt Costa (Matt Costa?!) and Donavon Frankenreiter loosened from the carbonite of 2006 only to be plugged into the curious infrastructure of KAABOO’s prefabricated lineup, there are still too many Lenny Kravitz-era rawk gawds posturing in the soft lights of Gordon’s approachable festival to be taken seriously. We get Dana Carvey. Bumbershoot gets Ron Funches. I wonder if KAABOO’s talent buyers simply copy and pasted the lineup to Humphrey’s Concerts By the Bay onto their website, and hit send. As a community, we have to wonder if this is the type of arts and music festival that we deserve: mandated by accessibility, laziness, and vacuous functionality. Or if we want a festival that mirrors our times, our comedy, and our most valuable artists and their messages. As of now, it remains to be determined.